Yesterday I received an e-mail from an Amiga developer calling himself Lemming880. He is from the Netherlands and a member of the EAB (English Amiga Board) forum. He told me he’d just released a brand new game for the Amiga! 🙂 This is truly another piece of superb news coming out of the Amiga community these days. Let’s hope it will continue for the rest of the year! 🙂 Big thanks to Lemming880 for his hard work and for releasing this software for all of us to enjoy. 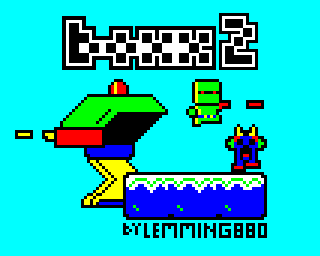 I think Boxx 2 looks like a very fun platformer. I will let my daughter have a go at it tomorrow – I’m sure she will like it! Thanks for your comment! 🙂 Things looks pretty promising so far this year. I believe we’ll see more games come out in the coming weeks and months. Stay tuned! It looks nice, but the requirements sounds a bit strange. Maybe the game was developed in AMOS (it does not look AMOS-ish however…) or a Basic flavor, and that’s why it is so CPU hungry. Net net that’s really cool there are still folks who develop stuff for 90s beasts! Hi there! Thanks as usual for commenting. 🙂 The game has been developed in Backbone which is a GUI-based games creation package. It is a bit slow, but works well on 030 and upwards and of course on emulators.